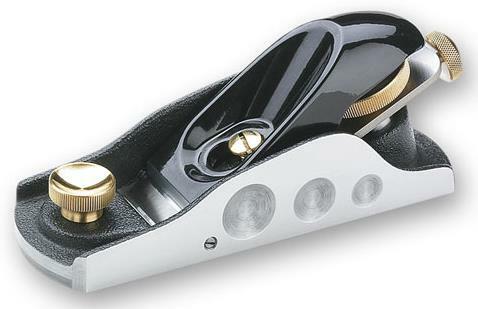 The standard block plane is preferred for general purpose work. The 20° bed angle plus the blade's 25° bevel angle results in an effective cutting angle of 45°. The low profile lever cap fits the hand well, at only 3.2mm higher than its low angle variant (weight 790g(1.3/4lb)). In all other respects, it is the same as the low angle block plane. The lapped blades have a flatness tolerance of ±0.005mm or better over the working surface and with an average roughness surface finish of 0.000127mm(5 micro inches) or better.